Daria Kasatkina will make her first appearance in the second week at the Wimbledon Championships after defeating Ashleigh Barty 7-5, 6-3 in the third round. 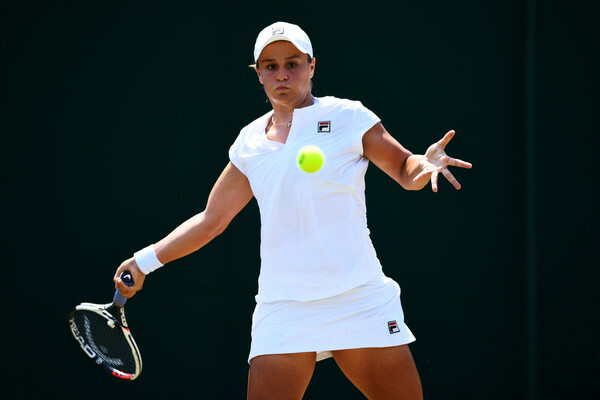 Daria Kasatkina stunned Ashleigh Barty in the third round of the 2018 Wimbledon Championships as the Russian managed to outhit and counterpunch the all-rounded Australian for a straightforward 7-5, 6-3 victory in an hour and 13-minutes of play, despite the process not being very straightforward. The 14th seed had to retrieve from a 1-4 deficit in the opening set before coming from a break down in the second set to grab the confidence-boosting win and book her spot in the second week, where she will face Alison Van Uytvanck for a place in the quarterfinals. Barty was unusually erratic, firing 18 winners which came along with a heavy price tag of 24 unforced errors. Whereas, Kasatkina was relatively consistent after a slow start, hitting 17 winners and unforced apiece. A quick service hold to start the match saw Barty assert her authority across the court, firing down some powerful serves alongside her solid groundstrokes. The Australian earned a quick hold to love, while Kasatkina seemed to follow it up with one of her own. However, just after she claimed game points, her erratic self grew more evident before her low first-serve percentage cost her the game, allowing Barty to hit winner after winner to grab the early break. Barty easily consolidated the break as her serves were unreturnable, with Kasatkina finding no answers at all. The Russian finally managed to get on board after an eternity, despite hitting yet another double-fault in the process. Winning 12 consecutive points on her serve, Barty powered to a commanding 4-1 lead before she threatened to extend her lead by earning multiple break points yet again. Kasatkina saved them — with an ace and a forehand winner. This paved the way for her to narrowly hold her serve and lessened the deficit. Barty seemed affected mentally after missing out on those opportunities. She produced a slew of unforced errors and Kasatkina took full advantage, coming out of nowhere to break straight back and ultimately levelled the scores at 4-4. A quick exchange of service holds was ended with Barty losing her serve from 40-15 up at 5-5, as the Australian was losing her focus and started to put in an inconsistent performance. Kasatkina finally found the pace on her serves, and eventually served out the first set to love comfortably. A string of service holds started the second set as Barty was determined to send the match into a deciding set. Surprising unforced errors by the 17th seed saw her waste multiple break chances in the fourth game, which gave Kasatkina the confidence and allowed her to sneak through the tricky and nervy game. Once more, her failure to capitalize on her opportunities took a hit on her confidence — and she was immediately broken in the following game. However, it proved to be just the start of three consecutive breaks, with Kasatkina having the last laugh as she consolidated the break for a 5-3 lead and placing herself just a game away from the win.